The LED Safety Flare emergency kit is generally used as broken vehicle traffic warning, police street mark, identification for emergency vehicle discovery, marine rescue identifier, keep away warning, large and heavy vehicle transport cautioning, emergency rescue identification, campground or climbing identifier, open-air lighting, boating, cars and so on. The 3 Pack LED flares light are included in the package, plus a convenient storage bag. The LED warning light is shatterproof, crushproof and rainproof, a must have for car trunk emergency or bicycle emergency. 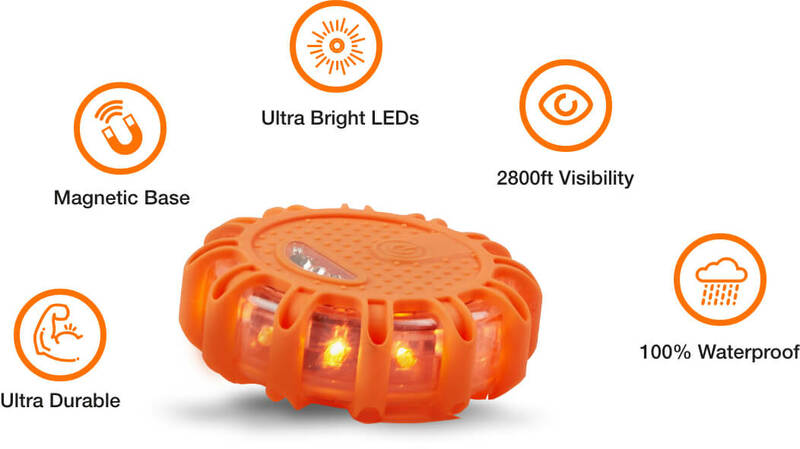 Superior visibility: Super bright LED array can be seen up to 1 mile at night; I t can be used for traffic control, as a warning light, as a rescue beacon, and for any other emergencies. They can also be used for recreational activities such as camping and hiking. 9 different flashing modes, included SOS rescue and 3 LED flashlight. Providing 9 warning light which can help in different situation. 3 AAA batteries are included for ready use, runs up to 36 hours. 100% satisfaction guarantee. ON the car/van/tailgate these work FANTASTIC b/c the projected light from the sides light up the body of your vehicle as well as being seen from straight on (top view if flare is placed ON back of your vehicle). Even when placed flat on the road have very good visibility. 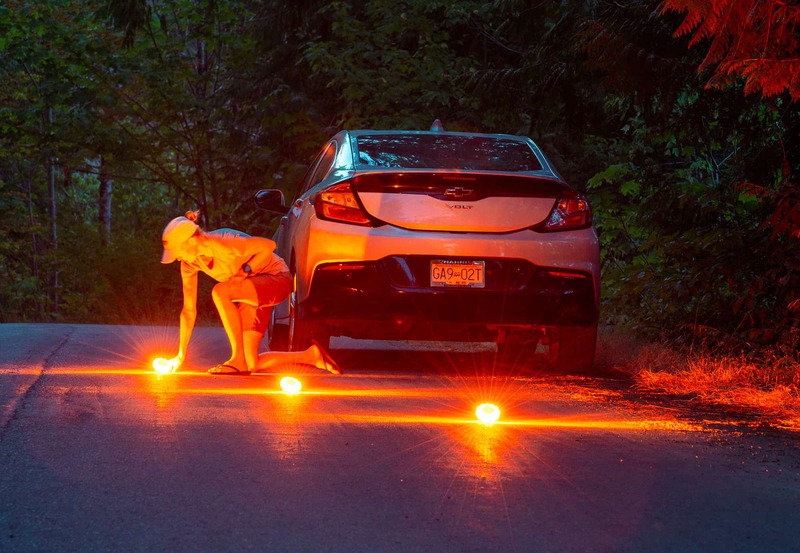 I had concerns b/c flare is a little bigger than a hockey puck and I'm used to TALL traditional roadside flares. But these are VERY safe (no fire; faulty ignition of traditional flare; no sulfur or burning molten Sulphur from traditional flare. The spinning light mode is probably the best. I use these because I'm a night truck driver and go on some roads or highway that or very dark and if my truck ever breaks down you can warn other drivers by far blocks away before they past you so they are warned and go to next lane so much better than the three reflective triangles at night. It would look like your coming up on a emergency vehicle.. I love these road flares. I used some of these that are similar at work. Love them. However, if using these next to the road, beware of drunks. These sort of lights seems to attract drunks rather than warn them. Highly recommend these flares.